Perhaps my favorite season in New York City was fall. It always seemed that the city somehow sprung back to life from a lazy hot and humid summer slumber. The atmosphere grew more vibrant as leaves changed color and cooler temps set in. The fall harvest seemed to energize the Union Square Farmers Market. Alas, we don’t have as dramatic a seasonal change here in San Diego, “where the climate must be perfect all the year.” So to compensate for this, I cook the fall dishes I used to make back in the city. Batali’s recipe calls for mezzi rigatoni, and should you choose to make this dish, I strongly suggest using this pasta shape; it has the perfect size and weight for this rich sauce. Unfortunately, I had run out of them and substituted penne rigate, which were OK, but definitely not as good as the recommended rigatoni. 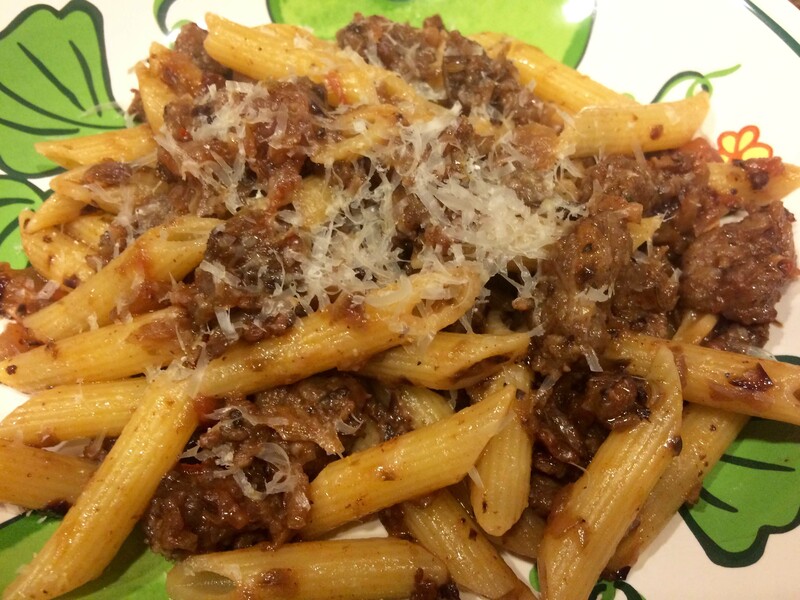 Lack of availability also forced me to substitute Parmigiano-Reggiano for the recipe’s Asiago. 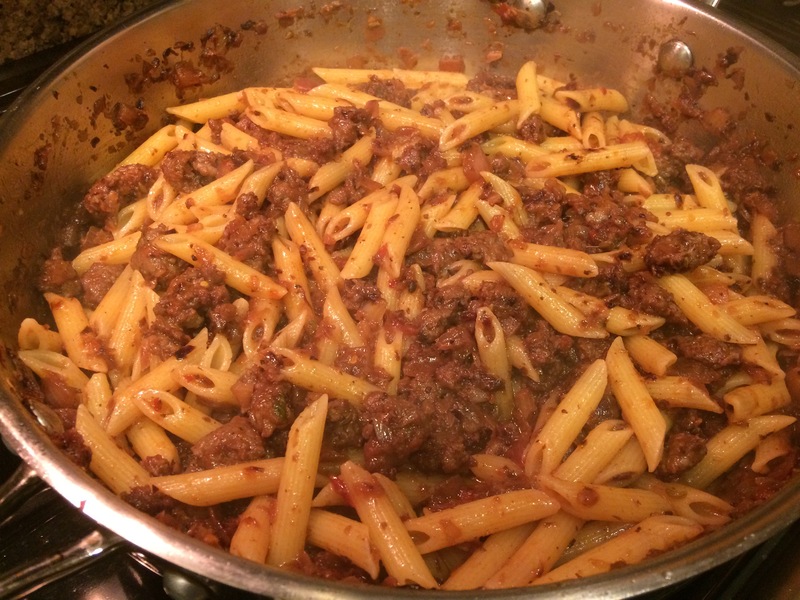 Batali’s recipe comes from his 2011 Simple Family Meals. Since I was cooking only for two, I pretty much halved the recipe’s amounts. 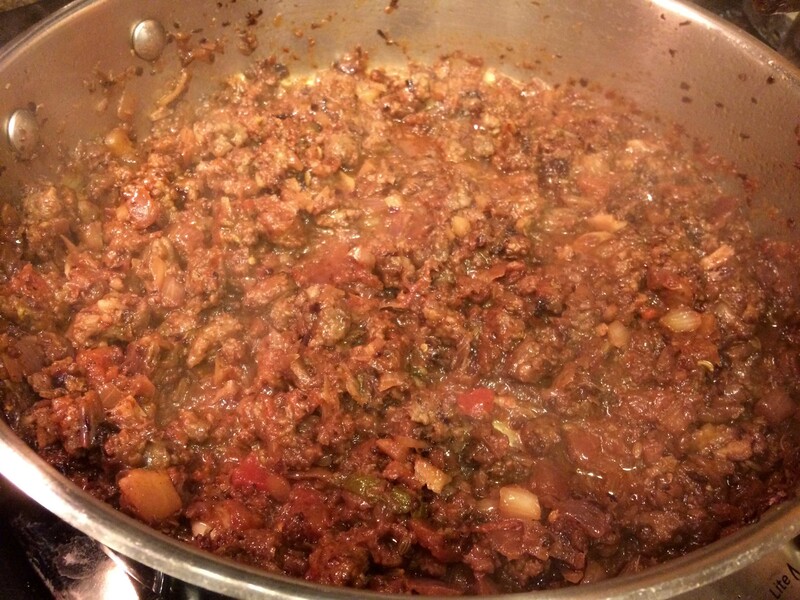 However, you can find the original recipe, which serves 6 as a main course, here. One final note: take your time with Step 10 of the recipe and so that the pasta is well coated with the sauce. 1. 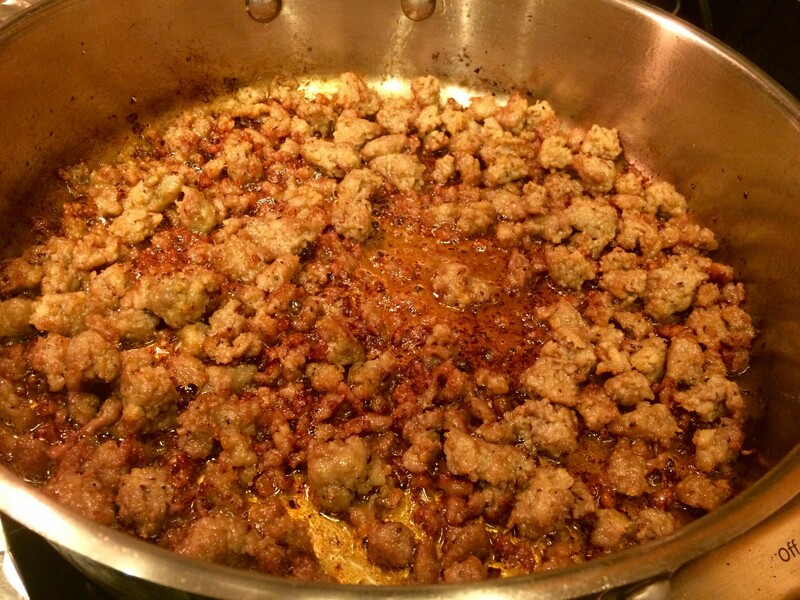 In a heavy-bottomed 12-inch sauté pan, cook the sausage over high heat, stirring occasionally, until it begins to brown, about 10 minutes. 2. 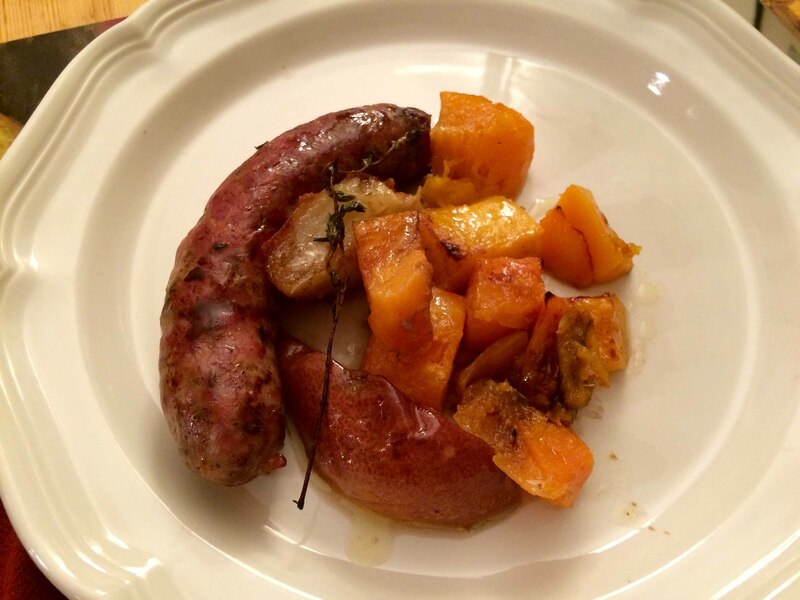 Using a slotted spoon, transfer the sausage to a plate. 3. 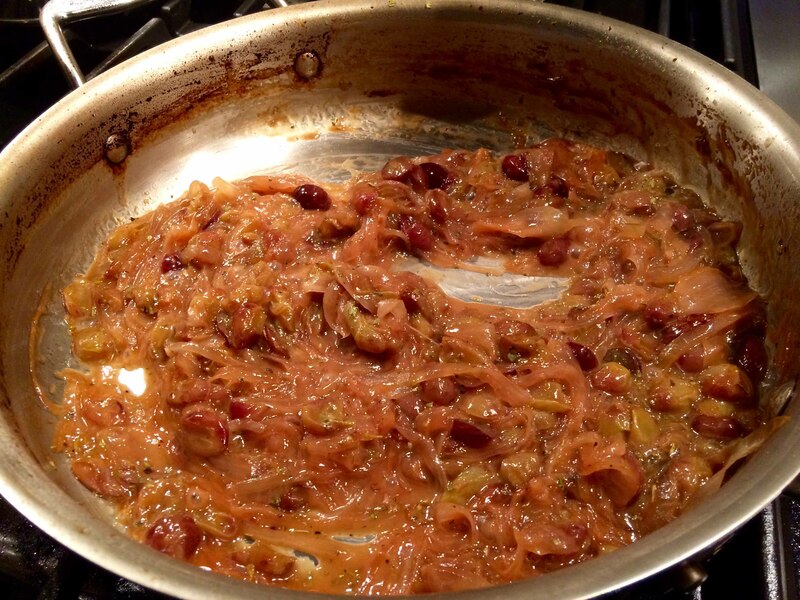 Add the fennel seeds, hot pepper flakes, onions, fennel, garlic, and radicchio to the pan and cook over medium-high heat until the vegetables are well browned, about 10 minutes. 4. 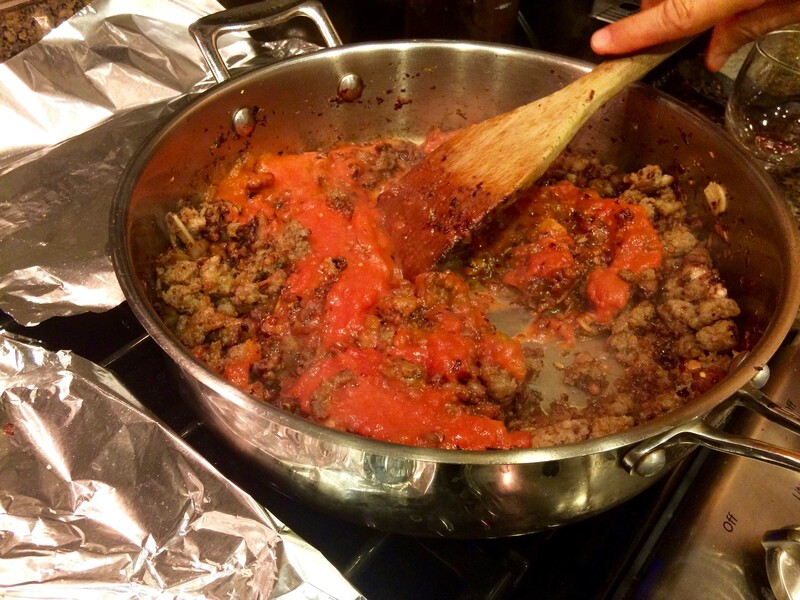 Return the sausage to the pan, add the wine and the tomato sauce, and bring to a boil. 5. 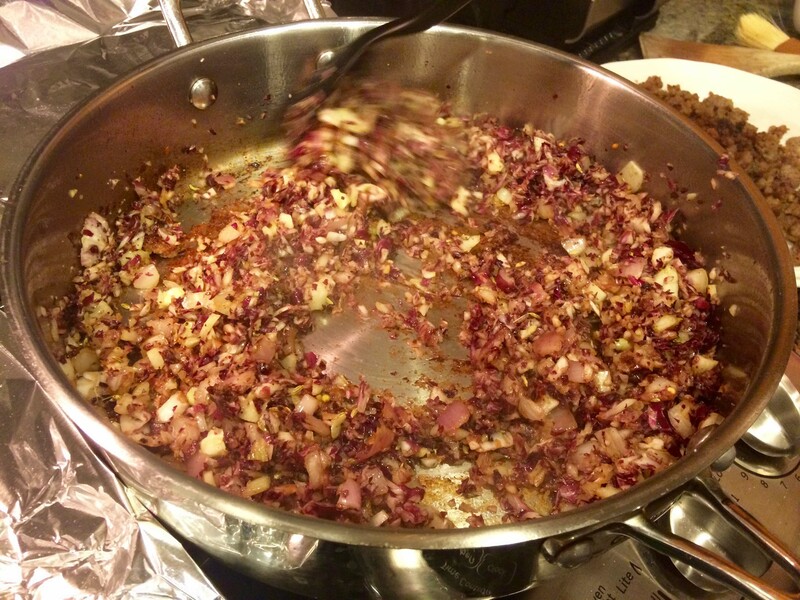 Lower the heat and simmer until the radicchio is very tender and the sauce as thickened, about 10 minutes. 6. Season well with salt and pepper, and remove from the heat. 7. Bring 8 quarts of water to a boil in a large pasta pot, and add 2 tablespoons salt. 8. Drop the mezzi rigatoni into the water and cook for 1 minute less than the package instructions indicate. 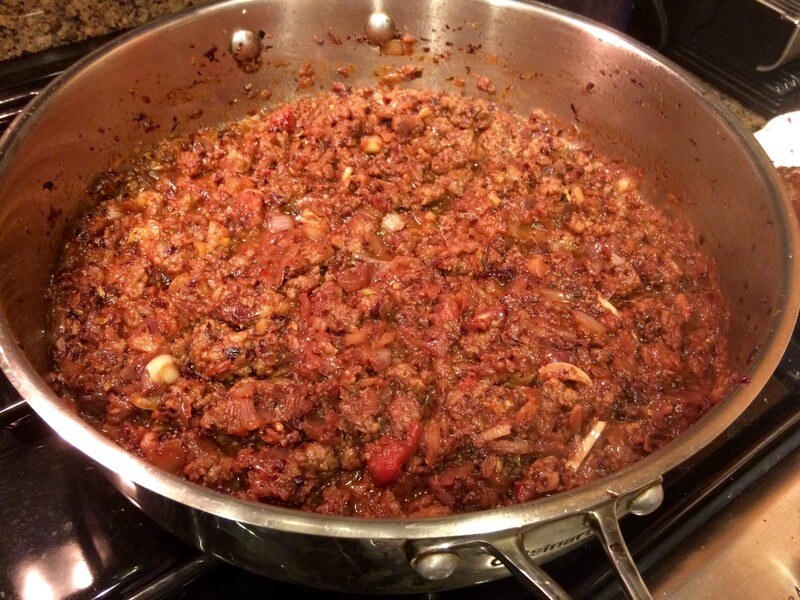 Just before the pasta is done, carefully ladle ½ of the cooking water into the sausage mixture. 9. Drain the pasta in a colander and add it to the sausage mixture. 10. Toss over medium heat for about 30 seconds, until the pasta is nicely coated. 11. 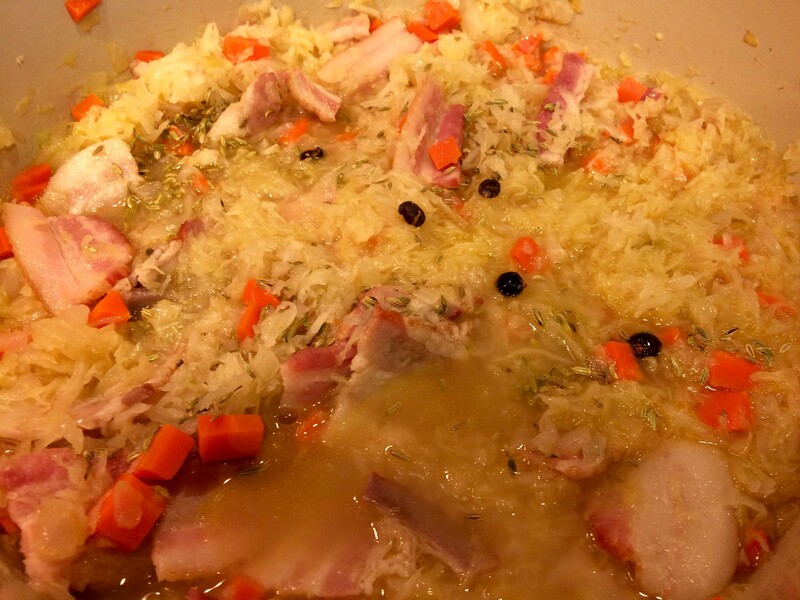 Pour into a warmed serving bowl and serve immediately, with a bowl of grated Asiago on the side. Although I enjoy serving on the board of my condo, it can at times throw me off my schedule for dinner. Such was the case last night. I had planned one dish and, owing to an emergency board meeting, had to substitute another that could be on the table at a reasonable hour for a weeknight. 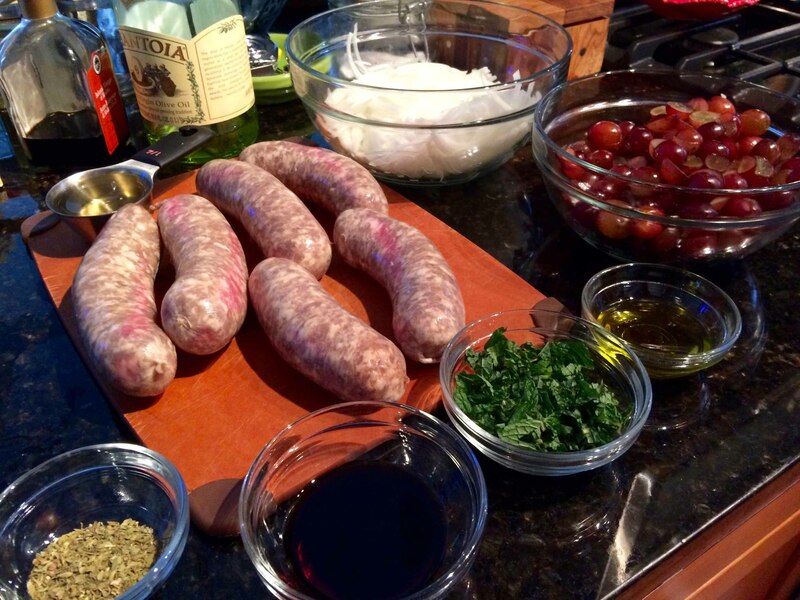 Fortunately, we had some sausages on hand that were intended for another dish as well as some delicious seedless red grapes. 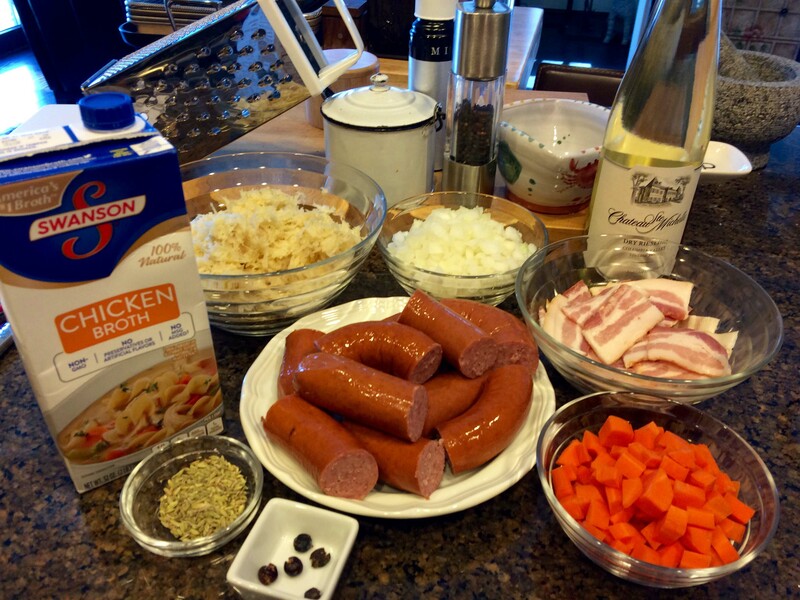 This combination of ingredients brought to mind a dish I prepared a few years ago, but a quick internet search uncovered an easier alternative. Unlike the earlier recipe, which called for sautéing the ingredients, this approach called for roasting them. And I must admit that on a weeknight I prefer roasting as a cooking method because it makes for easier cleanup than sautéing. 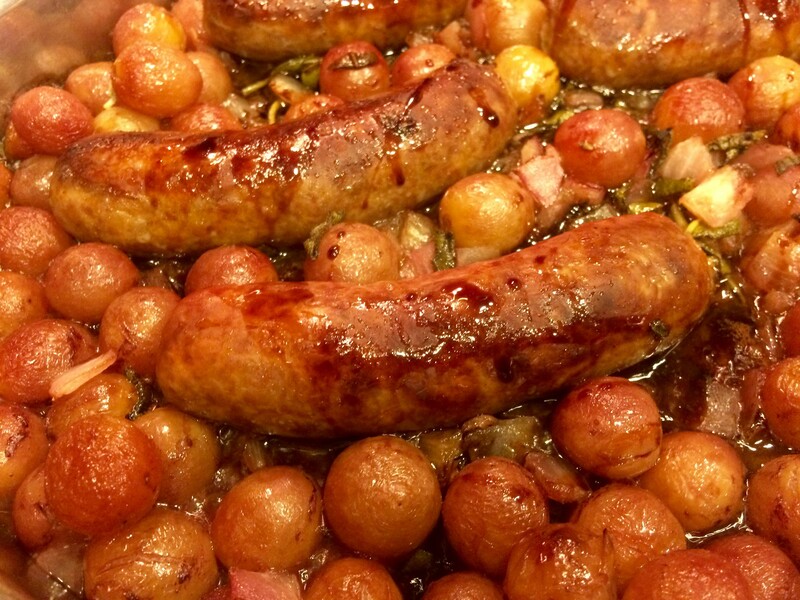 I made a few changes to the original recipe, substituting 1 pound of Italian mild sausages for 3 pound mix of sweet and hot and halving the amount of grapes. 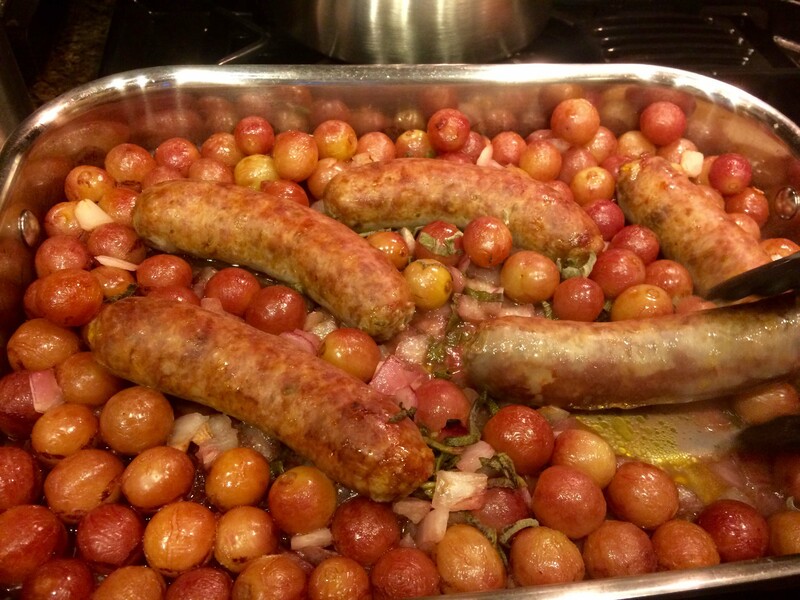 I also added about a cup of chopped red onion and a couple of tablespoons of chopped sage to the grapes and sausage before roasting. Finally, rather than using the suggested focaccia as an accompaniment, I served a simple polenta. 2. 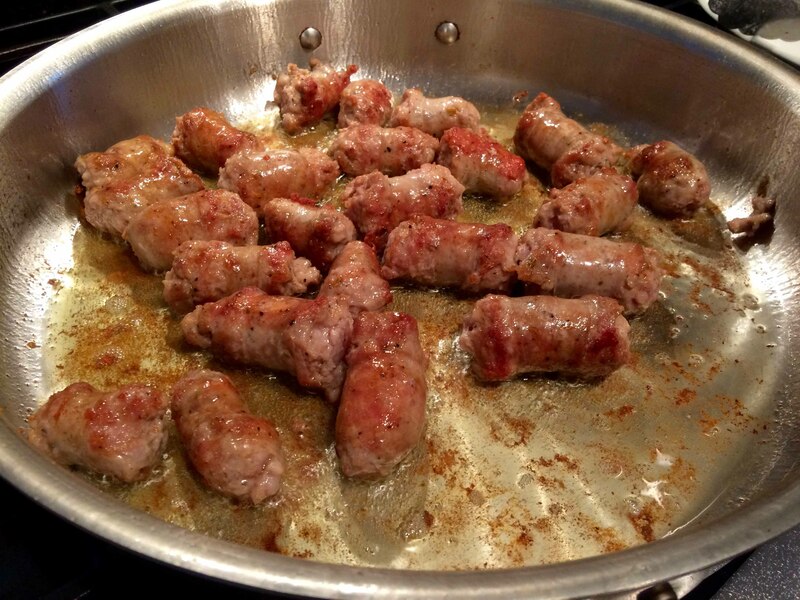 Parboil the sausages in water to cover for 8 minutes to rid them of excess fat. 3. 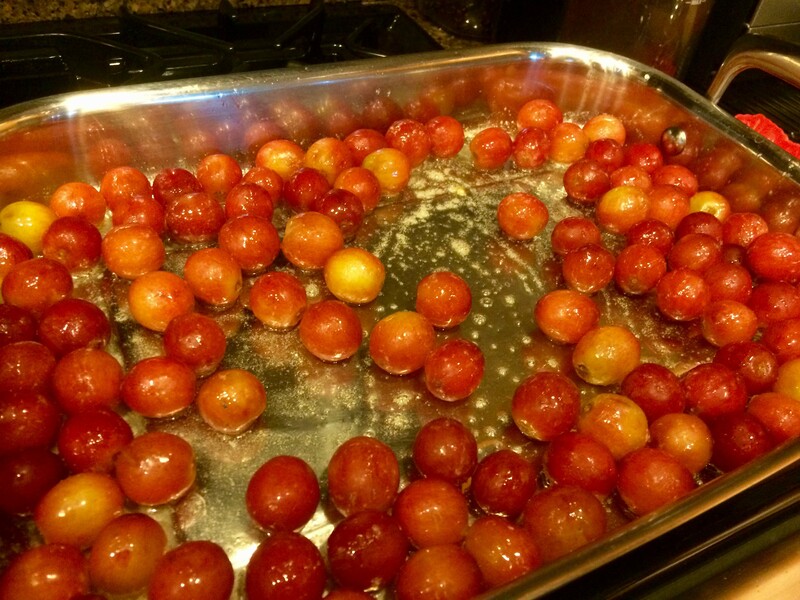 Melt the butter in a large heatproof roasting pan, add the grapes, and toss to coat. 4. Over moderately high heat add the wine. Stir with a wooden spoon for a few minutes until the wine has reduced by half. 5. 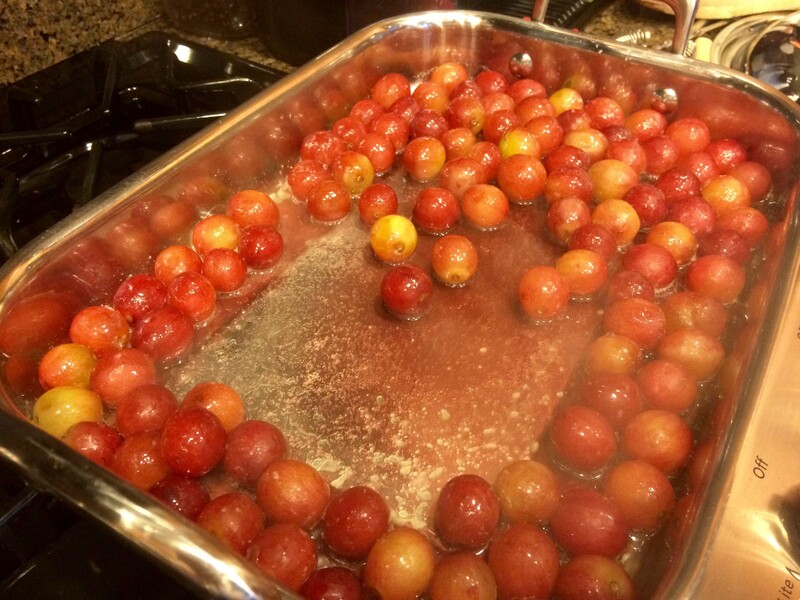 Using tongs, transfer the parboiled sausages to the roasting pan and push them down in the grapes so the sausages will not brown too quickly. 6. 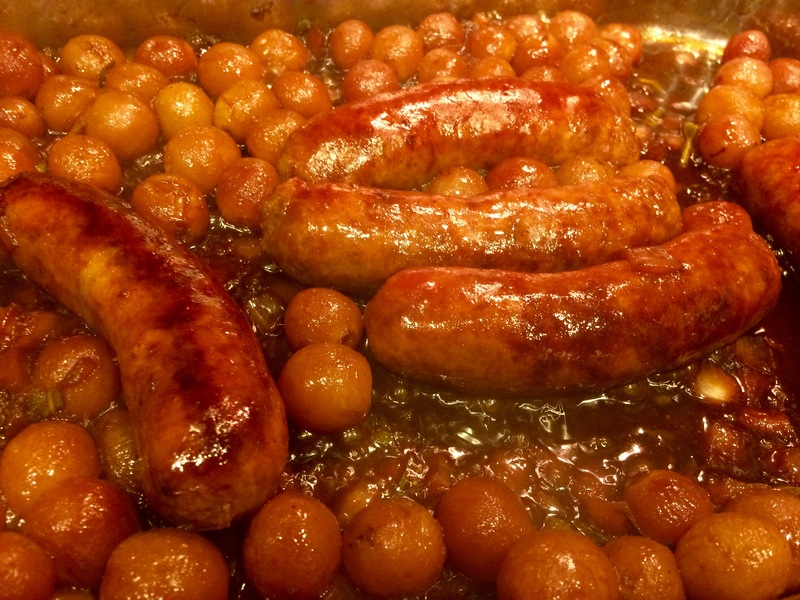 Roast in the oven, turning the sausages once, until the grapes are soft and the sausages have browned, 20 to 25 minutes. 7. 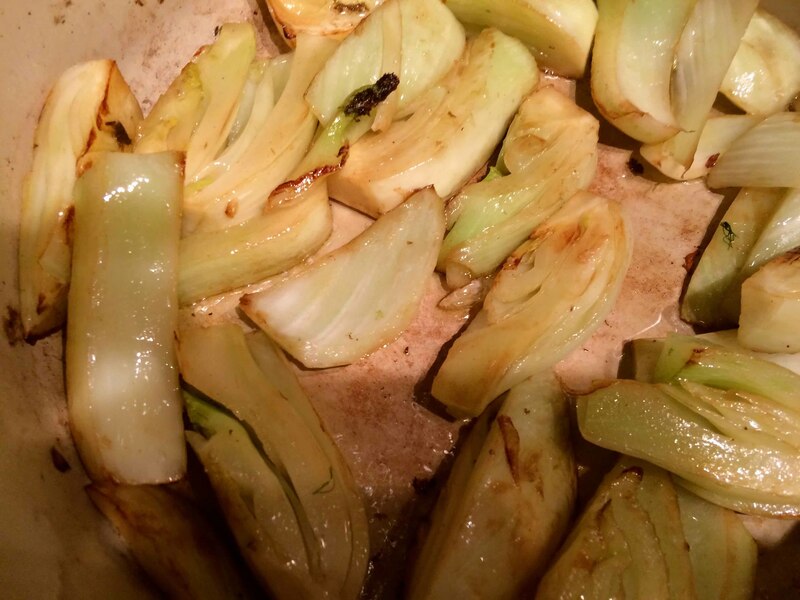 Place the roasting pan on top of the stove over a medium-high heat and add the balsamic vinegar. Scrape up any browned bits on the bottom of the roasting pan, and allow the vinegar and juices to reduce until they are thick and syrupy. 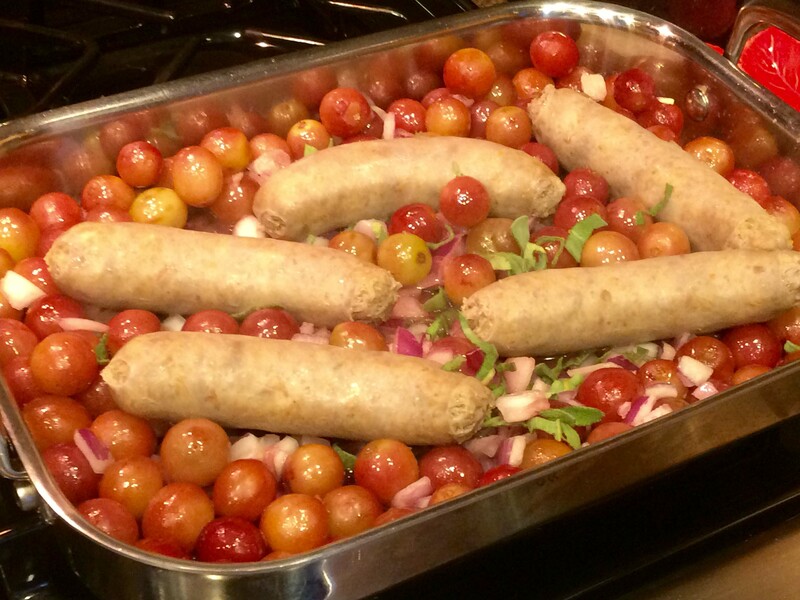 With a slotted spoon, transfer the sausages and grapes to a serving platter. 8. 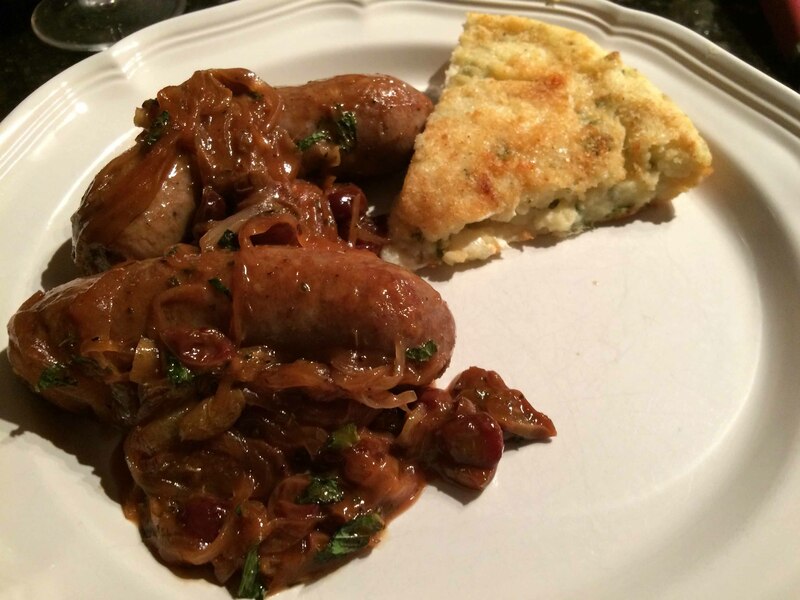 Pour the sauce over the sausages and grapes and serve immediately, accompanied with fresh bread. 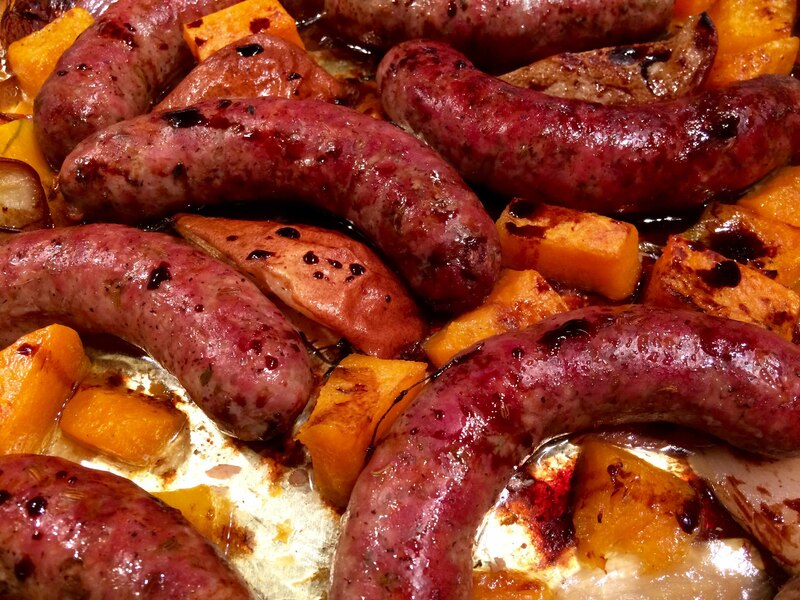 About a year ago while waiting for a doctor’s appointment, I saw a recipe on the Rachael Ray show for sausages roasted with butternut squash and pears. Well, after finding the recipe online, I finally got around to making it the other night for a small get together with friends. The colors and aroma of the dish echoed fall. 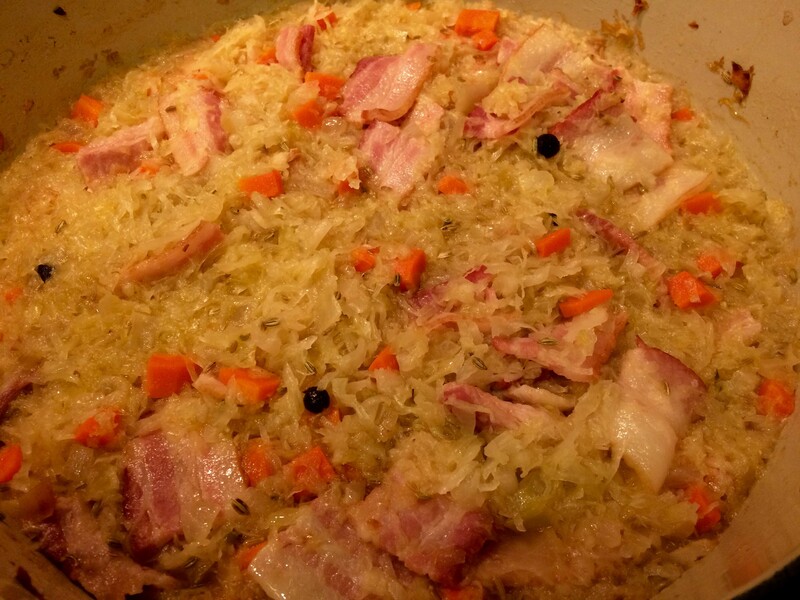 I made a few changes to the original recipe that included adding shallots and extending the cooking time. I also substituted a package of cut and peeled squash for the recipe’s large butternut squash. Place pears, butternut squash and onions into a large roasting pan. Drizzle with olive oil and season with some salt and pepper. Scatter the sprigs of thyme over top of the vegetables. 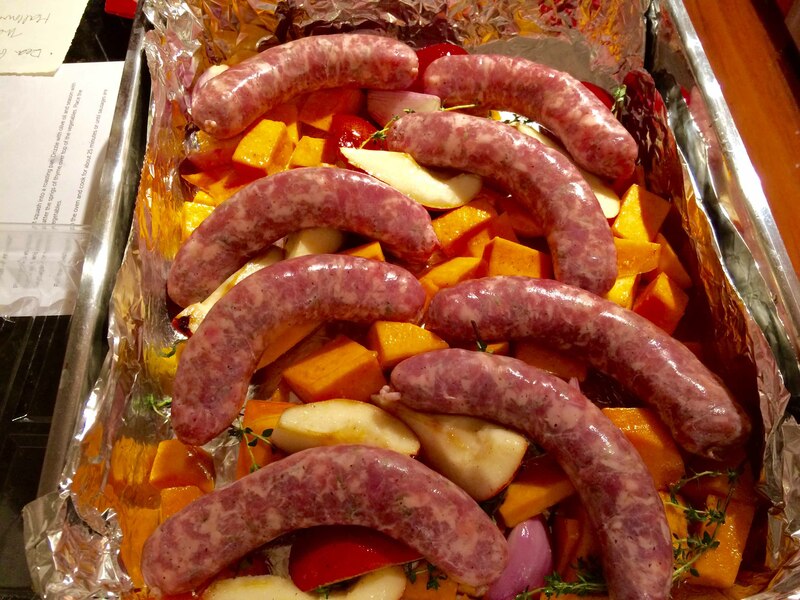 Place the sausages on top of the vegetables. 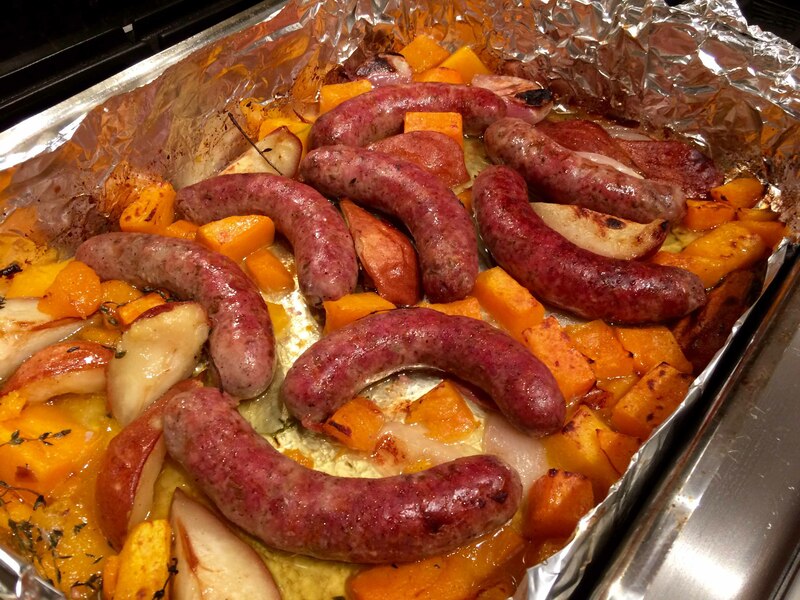 Drizzle the sausages and roasted pears, squash, and shallots with some balsamic vinegar. 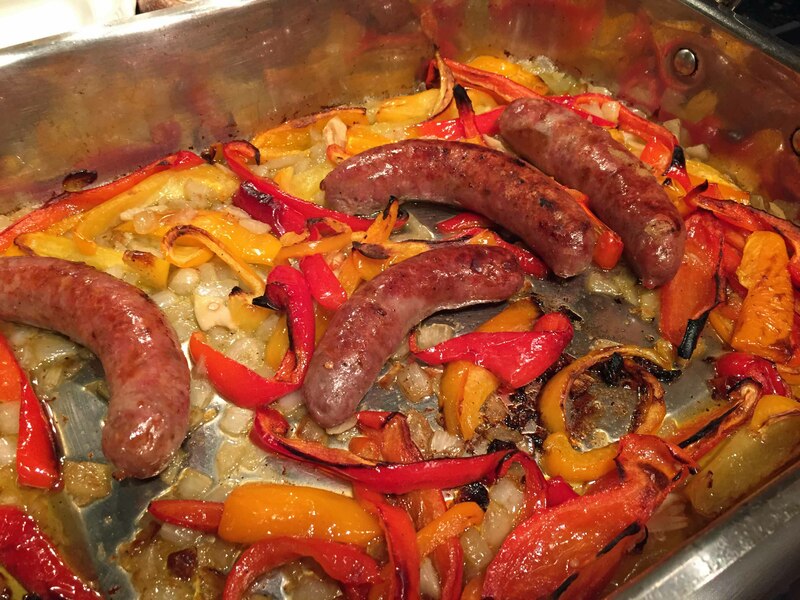 Sausage and Peppers has been a family favorite for years. My aunt would often prepare this for lunch on Saturdays, after we returned from shopping in our neighborhood’s Italian section on Avenue U in Brooklyn. She would serve them with bread still warm from the baker and a selection of cheeses from her favorite salumeria. These days, I often make it for an easy weeknight supper. 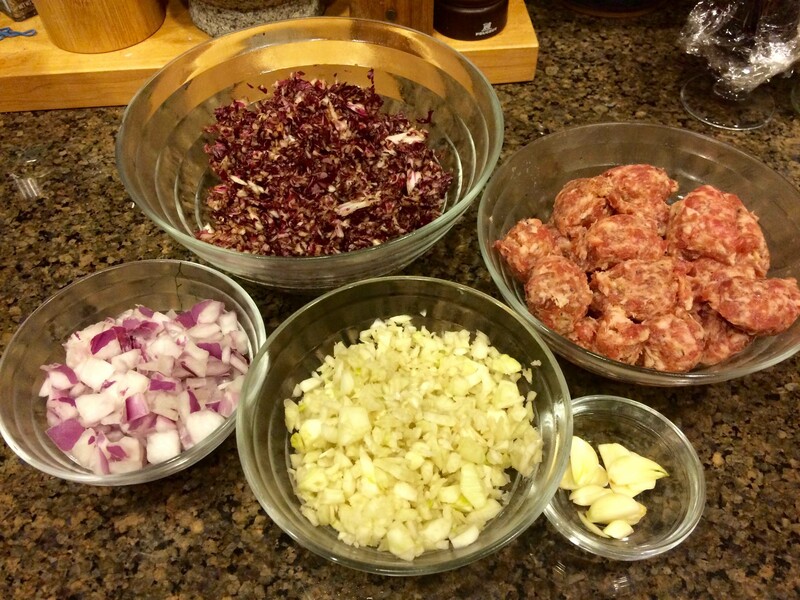 Like most cooks, my aunt would fry up the sausages and then use their fat to fry the onions and peppers. This is the way I too have prepared this dish—that is, until last night. Although I enjoy this Italian staple, I hate cleaning up the greasy mess it makes all over the stove. I thought there must be an easier alternative using my oven. I did a Google search and found several recipes that looked promising. I combined a few of them and came up with the one below. Once again, I hadn’t planned on writing about this dish, but it turned out so well that I had to share it with you. I don’t think I’ll ever use the stove top again to make it. Spray a large roasting pan with olive-oil spray. Place the sausages, peppers, onion, garlic, in the pan. Sprinkle with salt and pepper. Drizzle with olive oil and toss, making sure the sausages are in a single layer. Roast the sausages and vegetables for about an hour. About mid-way through, turn the sausages to ensure even browning. 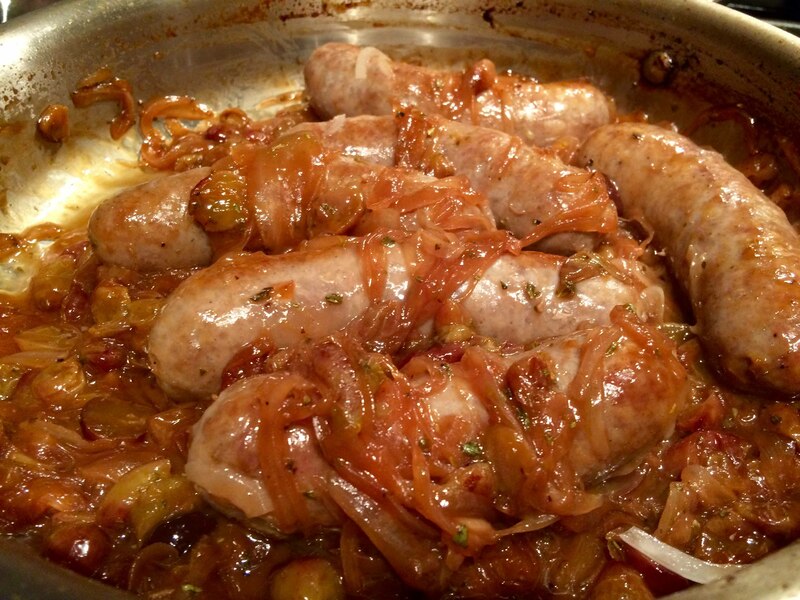 When the sausages and vegetables are browned to your liking, remove from the oven and serve. Squeeze some lemon on the sausage for added flavor. A request from my better half for chicken scarpariello, which by the way I had never had, led me to search my cookbooks for a recipe. None of them, however, contained one that met his expectations. 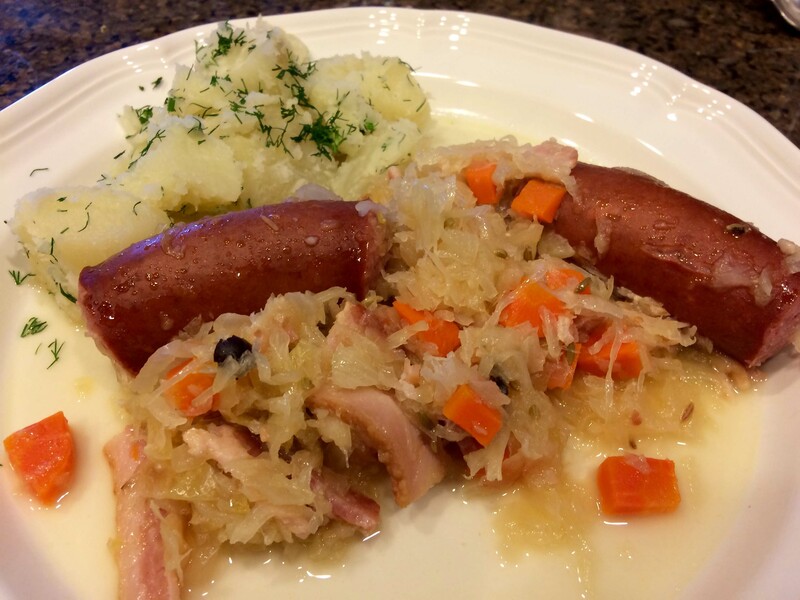 Consequently, I expanded my (now our) search to the Internet, where we finally found a recipe by Anne Burrell on the Food Network website that came close to meeting all the requirements. This Italian-American dish appears to have originated in New York City. 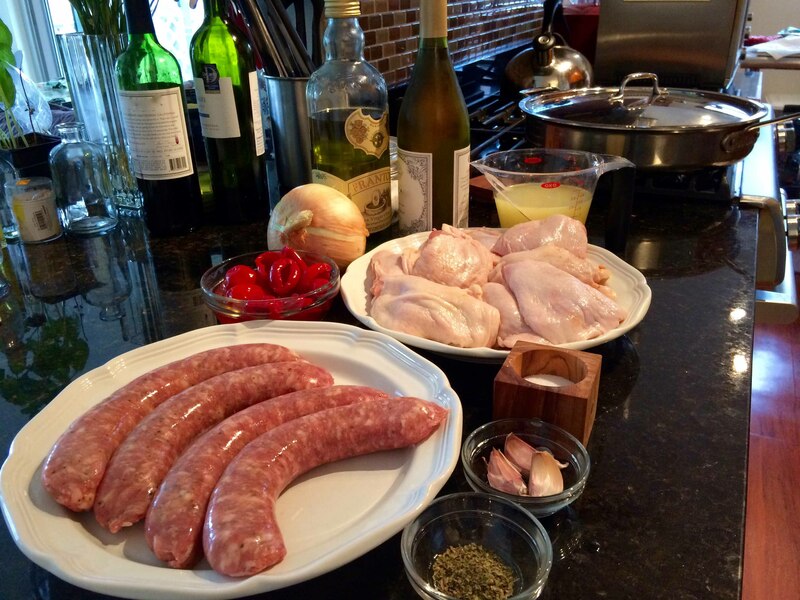 Its name, scarpariello, or shoemaker style, has been attributed to its being “cobbled” together from several ingredients that play a key role in it: chicken, sausage, and cherry peppers. 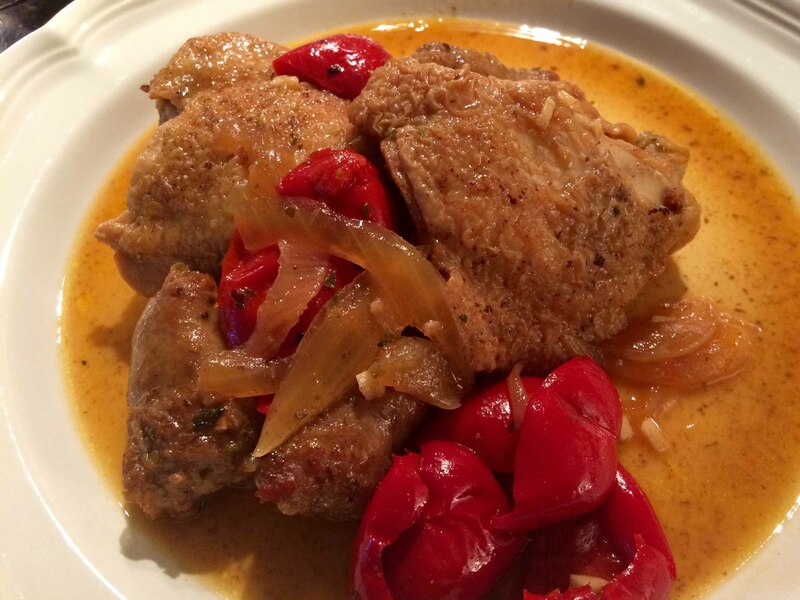 Although a good number of versions call for cutting up the chicken into small pieces to better absorb the sauce, I chose to use whole thighs, which allow for a slightly longer cooking time to reduce the sauce without drying out the chicken. 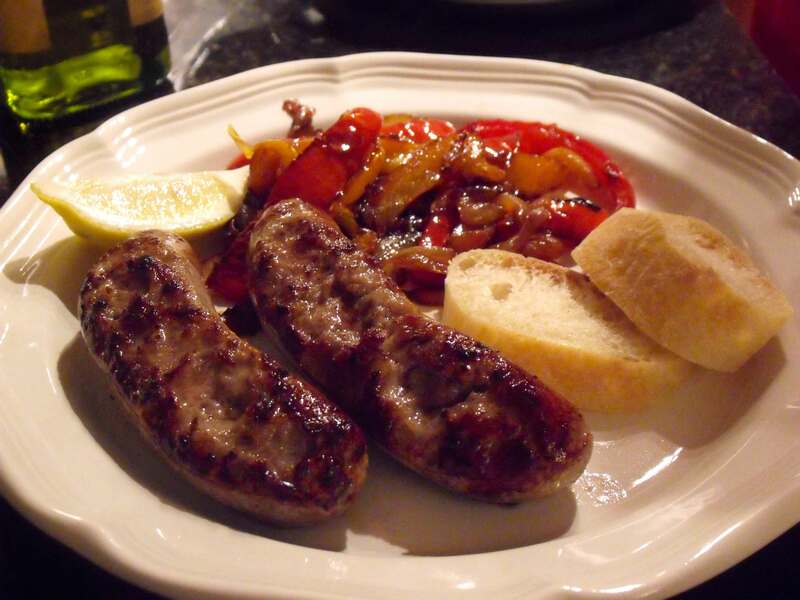 For the same reason, I also cut my sausages and peppers slightly larger than called for by the original recipe. Finally, rather than using hot cherry peppers, I opted for peppers that were labeled “hot & sweet” in order to reduce the heat and keep older digestive systems happy. Coat a large, wide, heavy-bottomed pan with olive oil and bring the pan to a medium-high heat. Add the sausage and brown well. 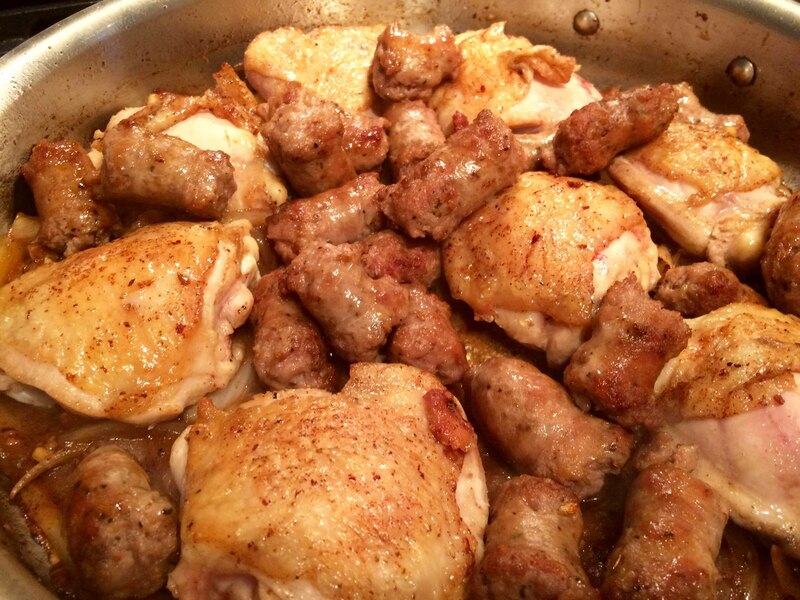 Trim any excess skin and fat from the chicken. 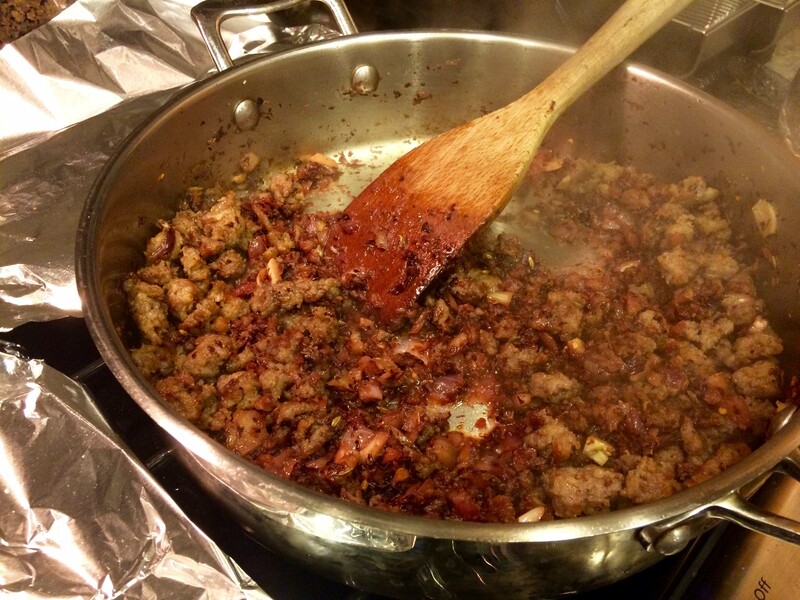 Season generously with salt and pepper and add to the pan that the sausage was browned in. Brown the chicken well. 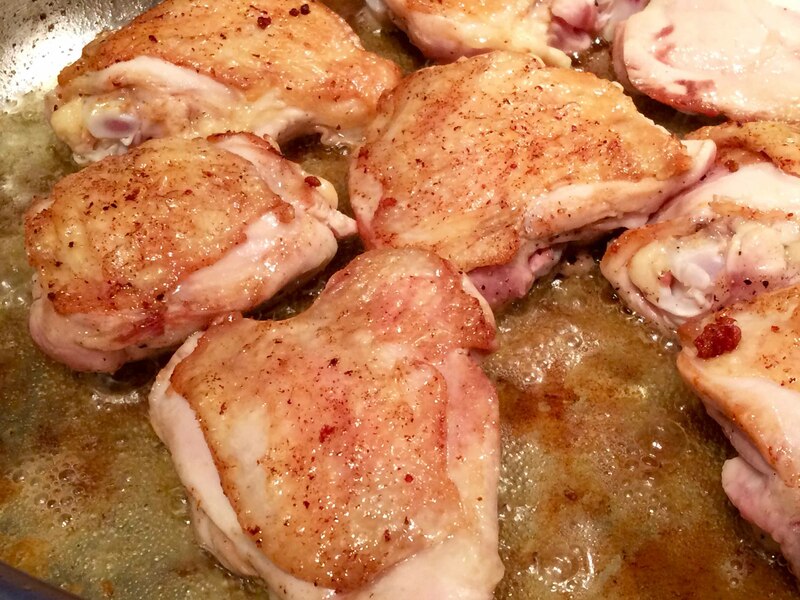 Once the chicken is brown on all sides, remove it from the pan and reserve. Drain the oil from the pan and return it to the heat. 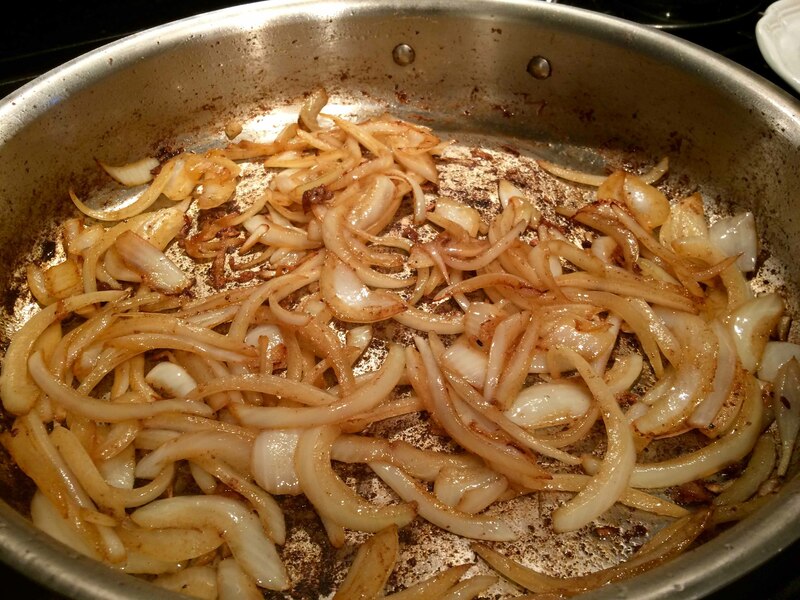 Coat the pan lightly with new olive oil, add the onions, and season with salt. 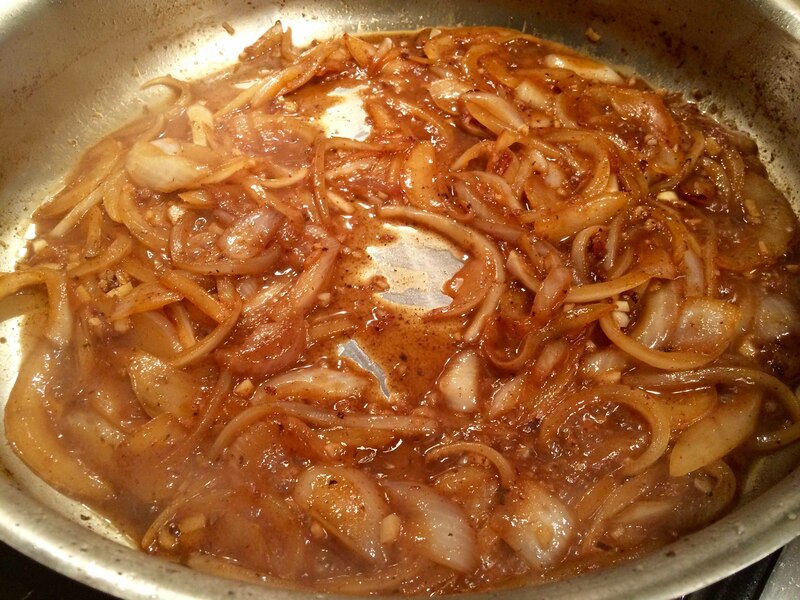 Cook the onions over medium heat until they are translucent and very aromatic, 6 to 7 minutes, stirring occasionally. Add the garlic and cook for 1 to 2 more minutes, being careful not to burn the garlic. Add the wine to the pan and reduce it by half. While the wine is reducing, scrape any browned bits off the bottom of the pan. 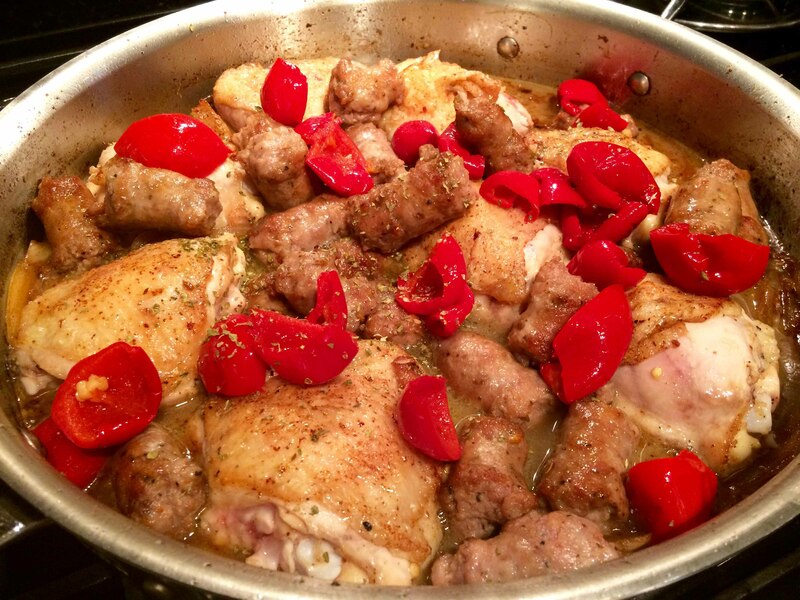 Return the sausage and chicken, along with any accumulated juices, to the pan and add the cherry peppers, cherry-pepper juice, chicken stock, and oregano. 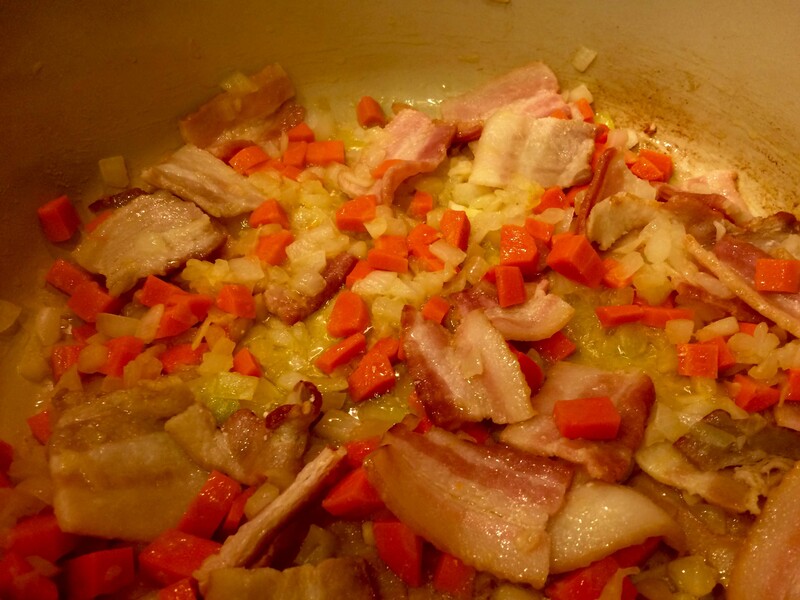 Bring to a boil, reduce to a simmer, and simmer, partially covered, for 15 to 20 minutes. 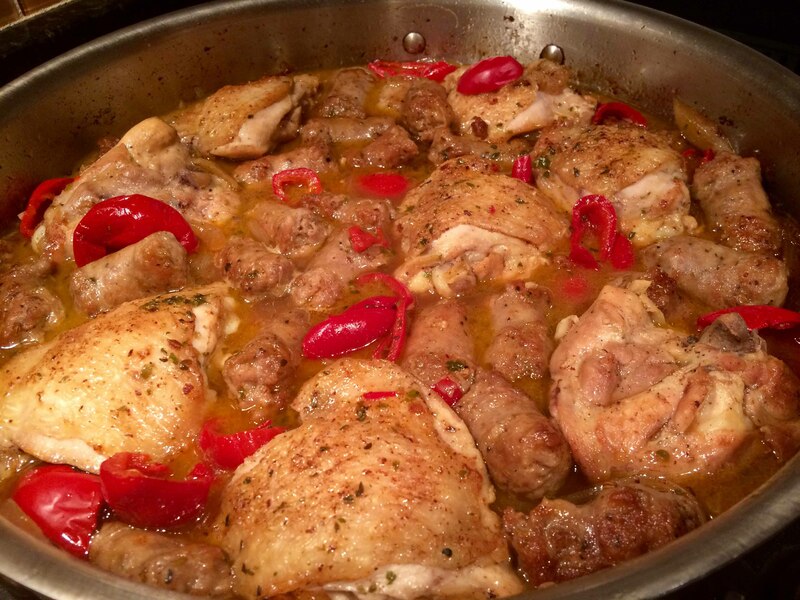 Remove the lid and simmer for 5 to 10 more minutes; add more chicken stock if the sauce has reduced too much. Taste and adjust the seasoning, if needed. The finished dish should be slightly soupy, spicy, and delicious. Early on Sunday evening, we usually sit down with a cocktail and some appetizers to watch the string of cooking shows on PBS. They’re a welcome calm alternative to the increasingly competition-driven line-up on the Food Network. One of our favorite shows is America’s Test Kitchen, which is both entertaining and instructive. 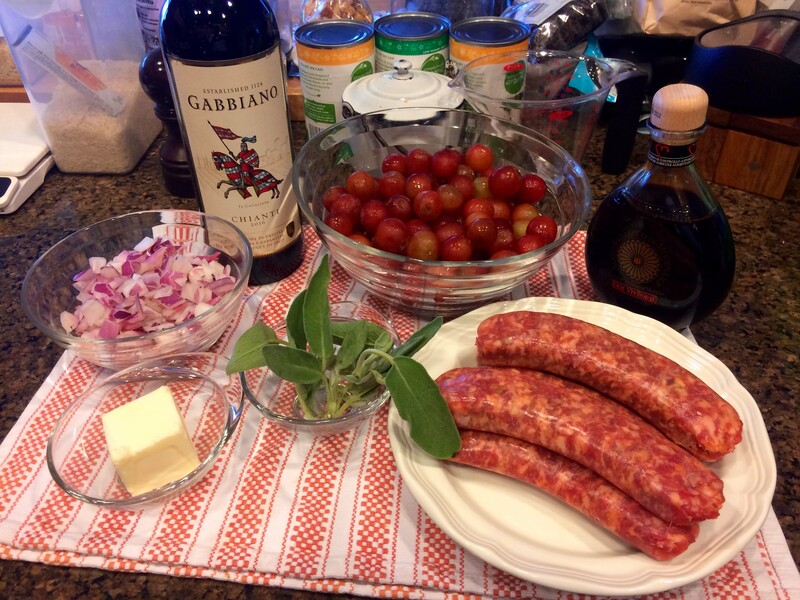 A recent episode of the series included a relatively simple weeknight recipe for sweet Italian sausages with seedless red grapes and balsamic vinegar that we both thought had to be on our table before the end of the week. 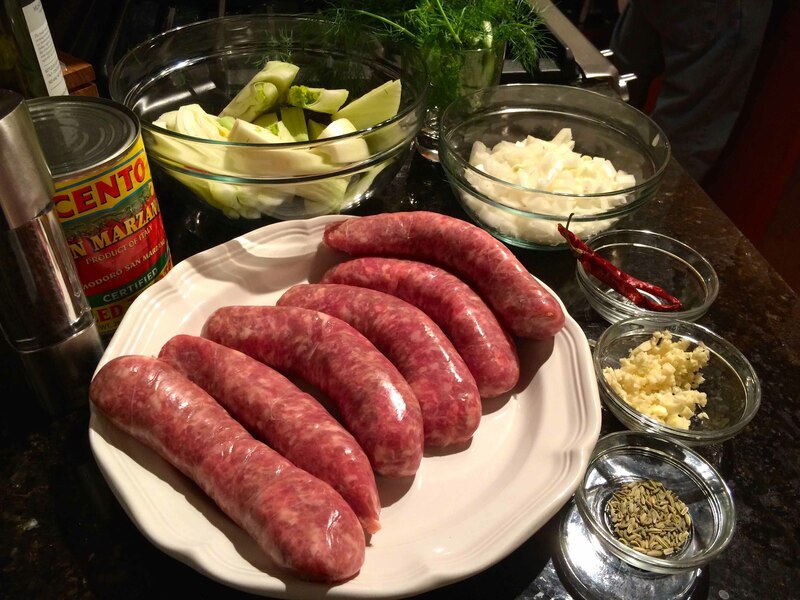 We found the combination of ingredients intriguing and came away with a better all-purpose method for browning and cooking sausage. I’m including a link to the show’s website, which, if you’re not a registered user, requires you to sign up. Registration is free. 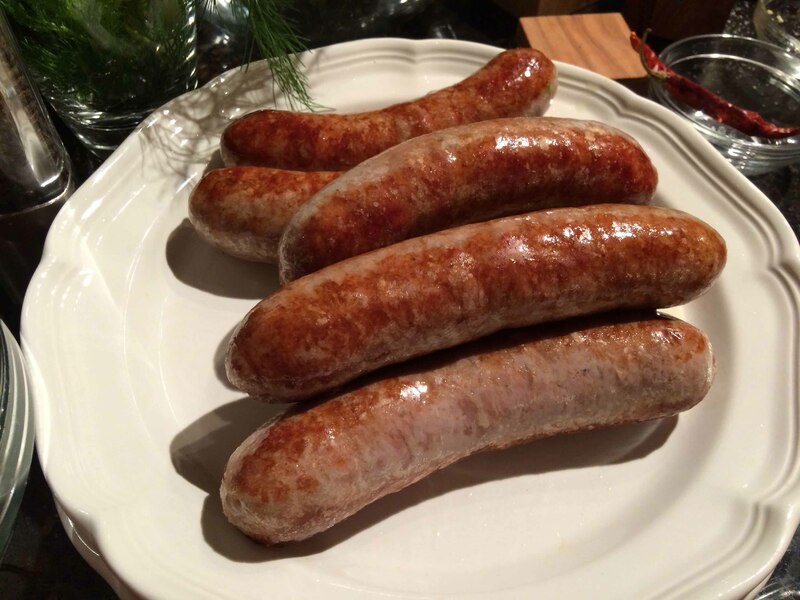 It’s worth the time and this page has an informative article on cooking sausages. 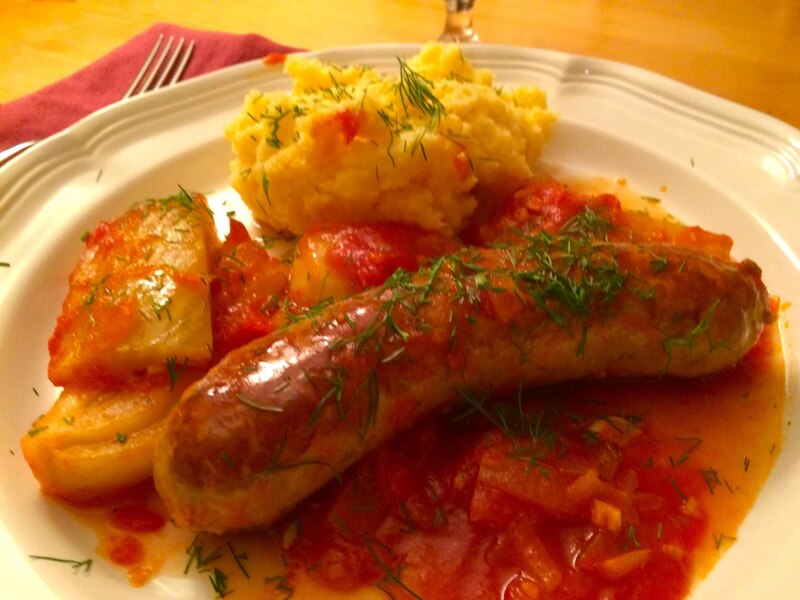 I served the sausages with my aunt’s Italian potato pie, but they would also go well with polenta. 1. Heat oil in 12-inch skillet or sauté pan over medium heat until shimmering. 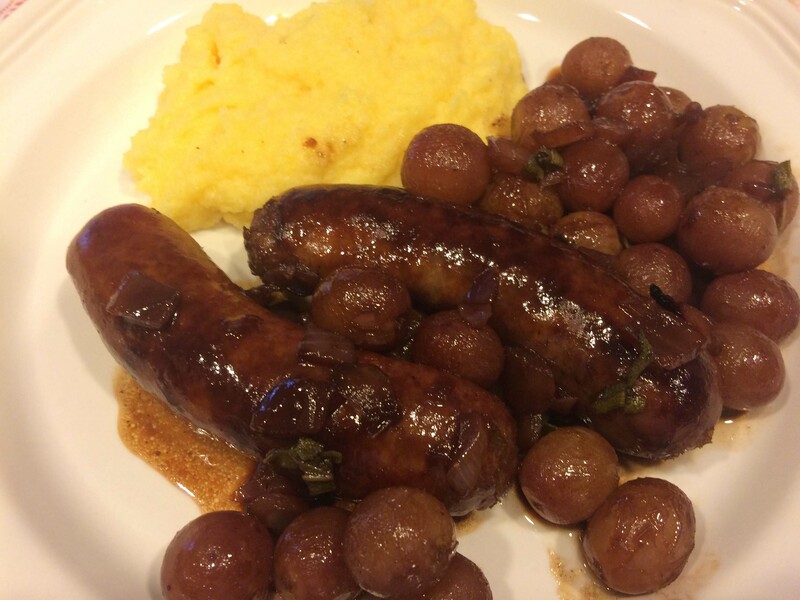 Arrange sausages in pan and cook, turning once, until browned on 2 sides, about 5 minutes. 2. Take off the heat, tilt skillet and carefully remove excess fat with paper towel. 3. 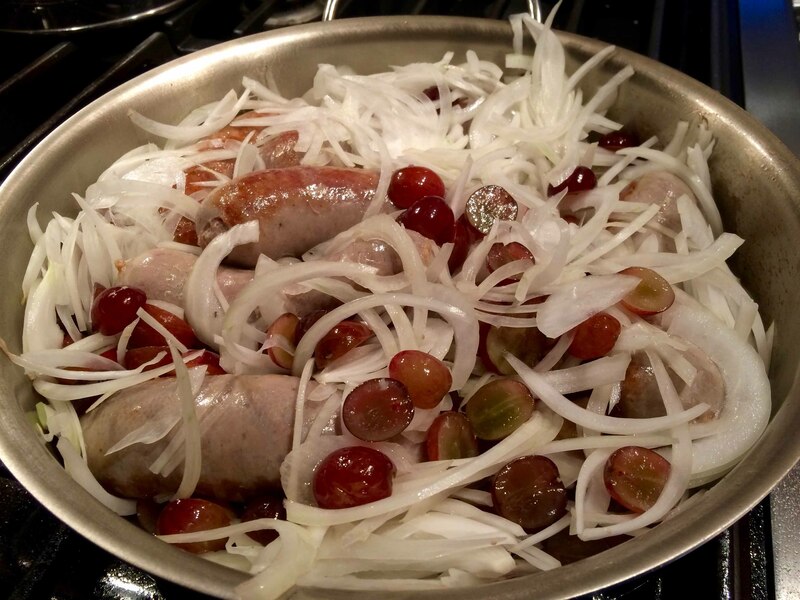 Return the pan to the stove and distribute grapes and onion over and around sausages. 4. Add water and immediately cover. 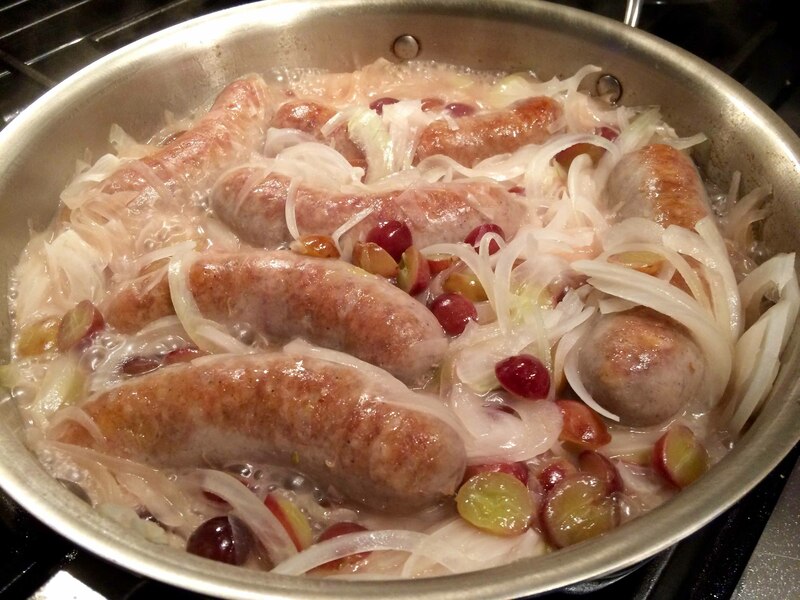 Cook over medium heat, turning sausages once, until they register between 160 and 165 degrees and onions and the grapes have softened, about 10 minutes. 5. 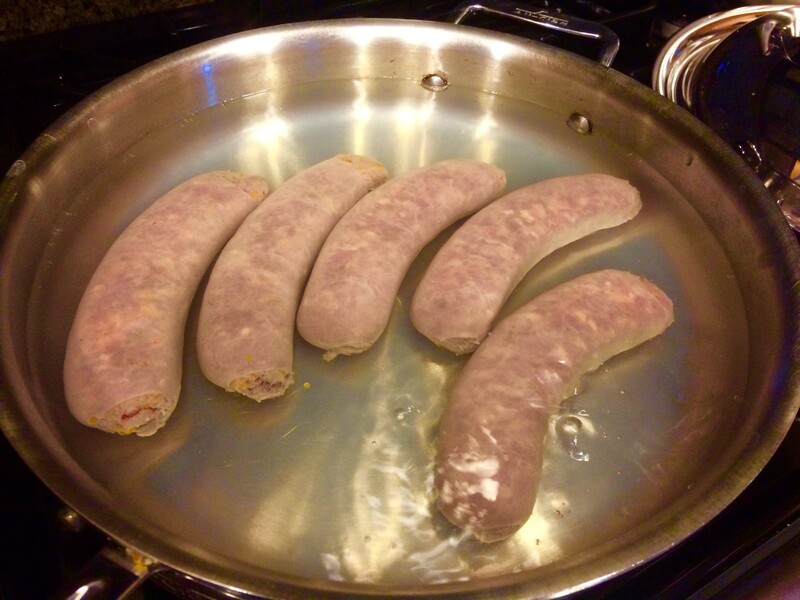 Transfer sausages to paper towel–lined plate and tent with aluminum foil. 6. 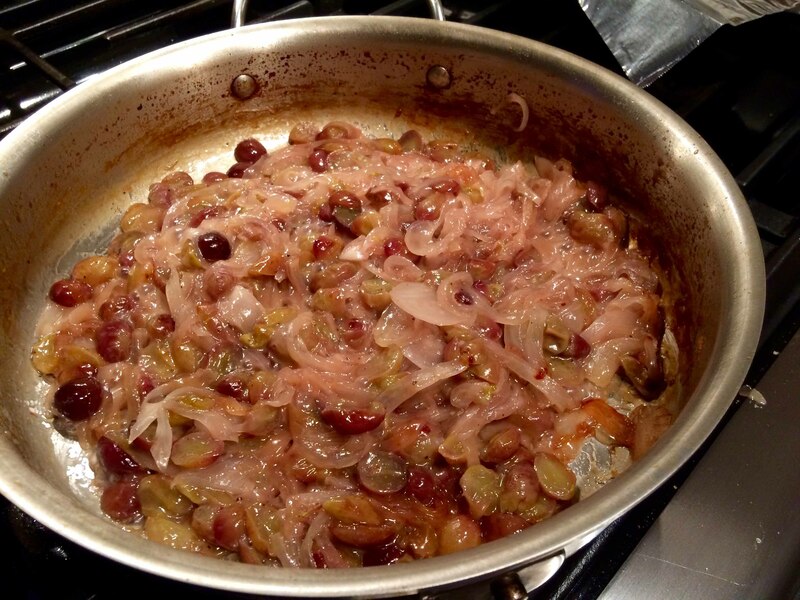 Return skillet to medium-high heat and stir pepper and salt into grape-onion mixture. 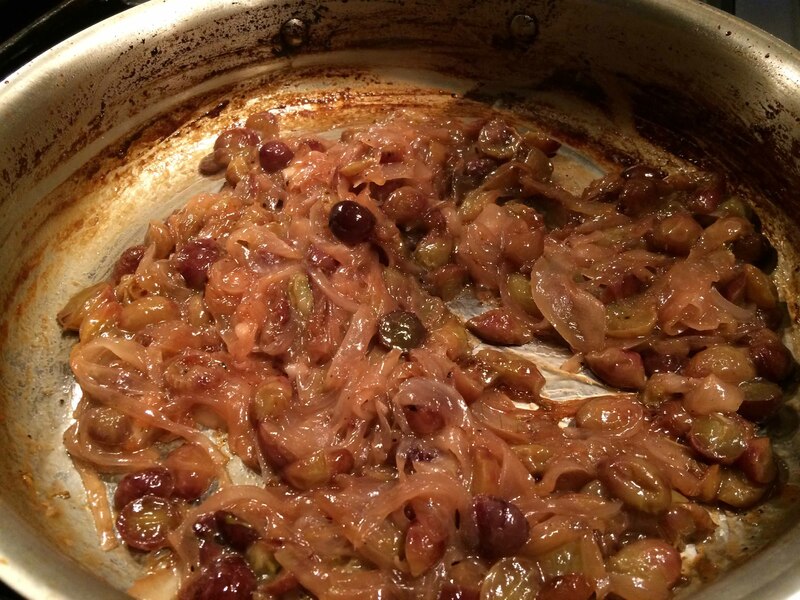 Spread grape-onion mixture in even layer in skillet and cook without stirring until browned, 3 to 5 minutes. 7. 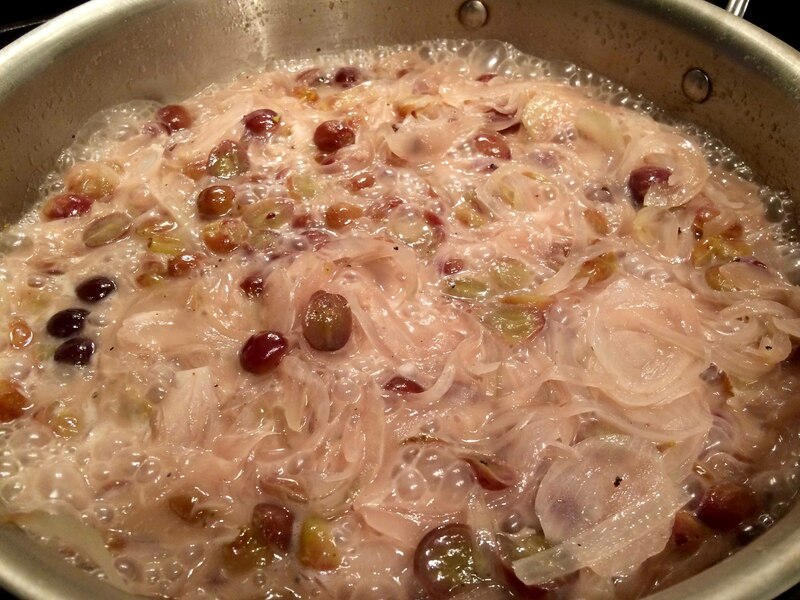 When browned, stir and continue to cook, stirring frequently, until mixture is well browned and grapes are soft but still retain their shape, 3 to 5 minutes longer. 8. Reduce heat to medium, stir in wine and oregano, and cook, scraping up any browned bits, until wine is reduced by half, 30 to 60 seconds. After deglazing pan with wine. 9. 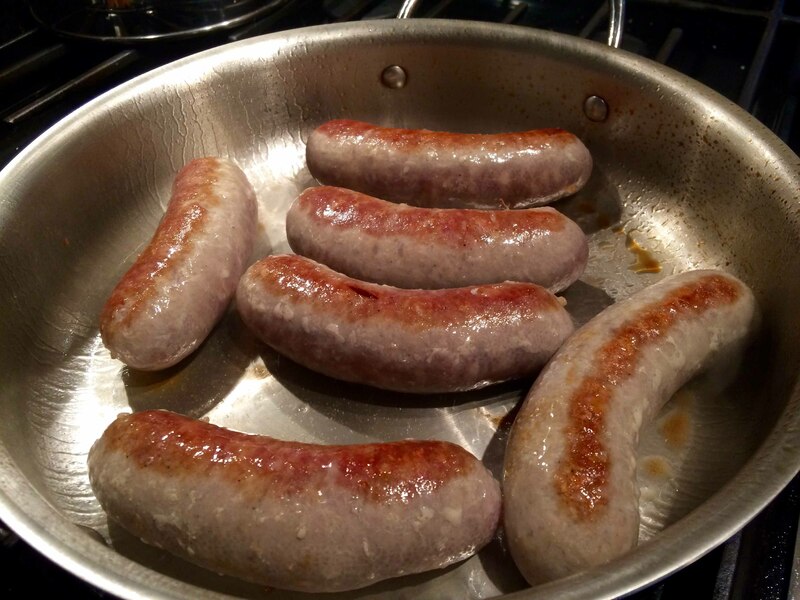 Return sausages to the pan to heat briefly. 10. Remove pan from heat and stir in vinegar. Sprinkle with mint and serve. Owing to our work schedules, Saturdays are typically filled with running errands and housekeeping. As a result on these days, I often look for dishes that are relatively easy to prepare and that can cook on their own while we catch our breath and linger over an aperitivo. I came across this recipe on the Food and Wine website and thought it would be perfect for a wintry Saturday evening. 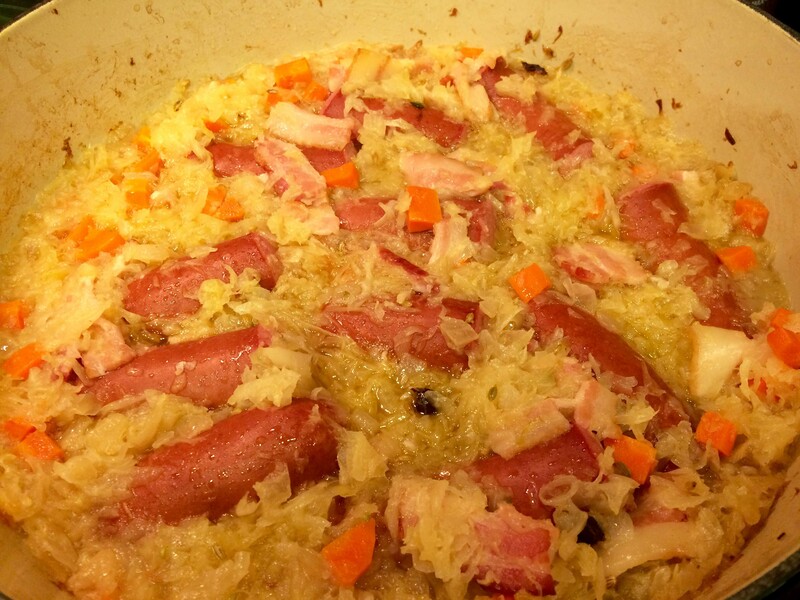 Including prep, it only requires about an hour and a half and as the sausages cook, the aromas tantalize the appetite. 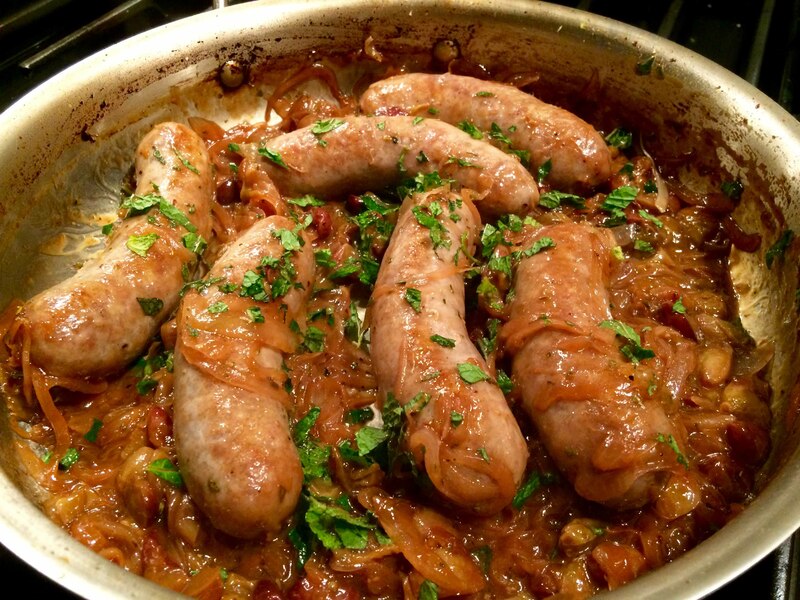 I’ve modified the original recipe slightly, reducing the number of sausages to 6 from 12 and the number of fennel bulbs from 3 to 2. The recipe recommends serving with creamy polenta and here, I opted for a quick-cooking 5 minute version. 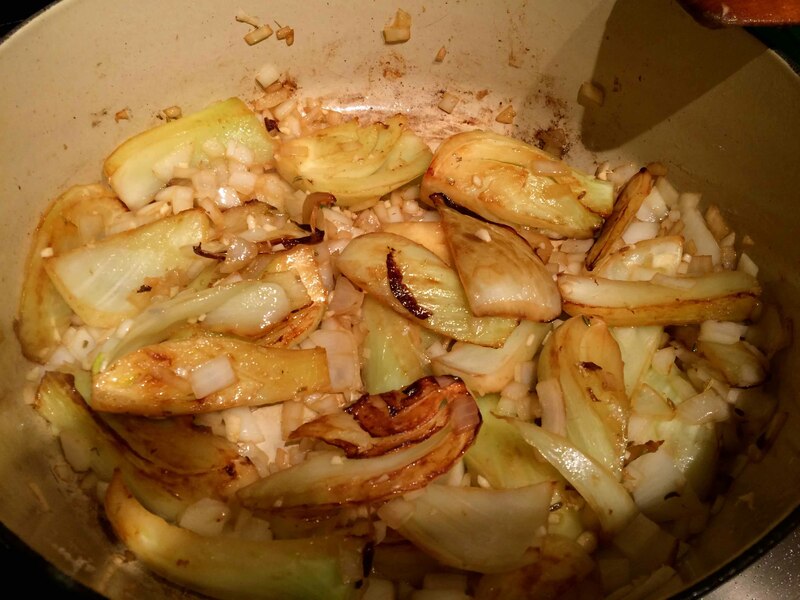 Add the fennel wedges to the casserole and cook over moderate heat, stirring, until golden, about 5 minutes. Add the onion, garlic, fennel seeds and 1 teaspoon of salt and cook, stirring, until the fennel is lightly browned, about 3 minutes. 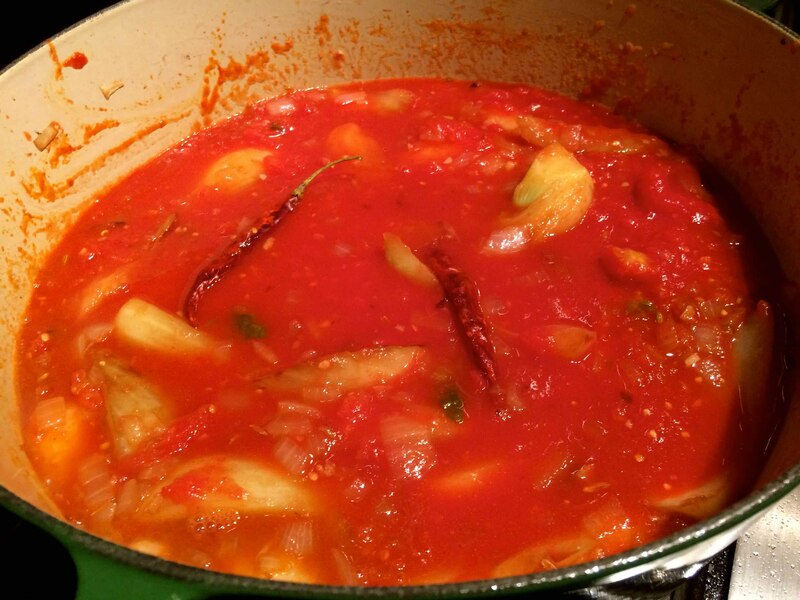 Add the tomatoes and their juices, the wine, and chiles. Tuck the sausages into the sauce. Cover and cook over low heat for 15 minutes. 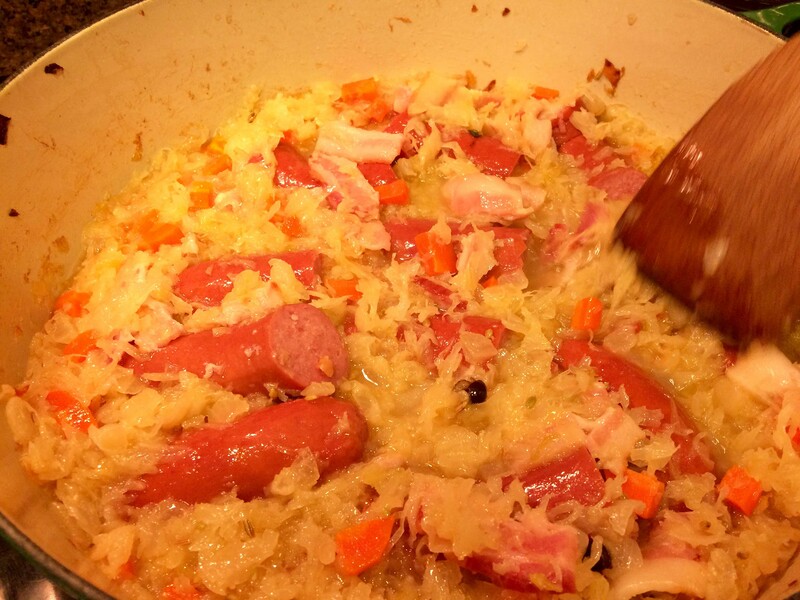 Uncover and simmer until the sausages are cooked through and the sauce is thickened, about 45 minutes longer. Garnish the stew with fennel fronds and serve over polenta. 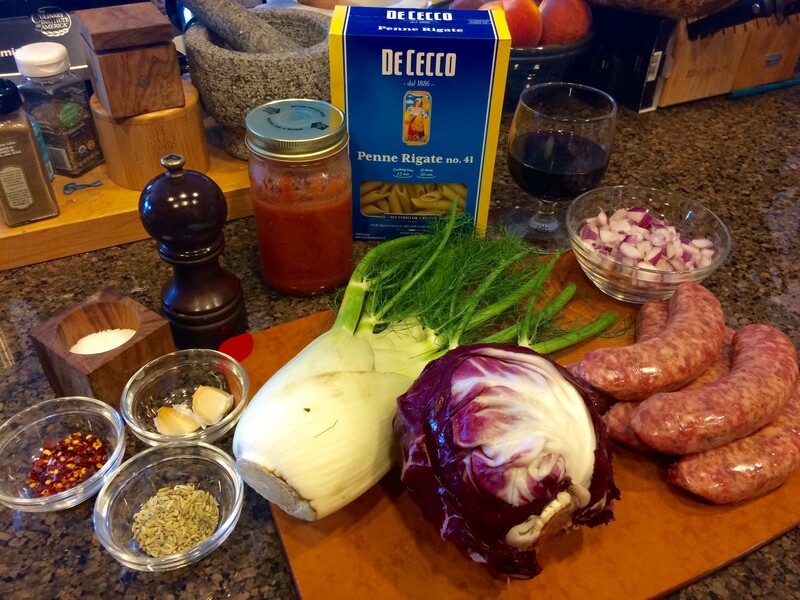 I cannot count the number of times I’ve prepared Italian fennel sausages. Last night, however, influenced by some cooking show, I opted to grill rather than fry them. Not as fortunate as the show’s chef, who used an open fire, I was limited to a stovetop grill pan. Yet despite this restraint, I’m happy to report that this grilling method yielded thoroughly cooked links that were delectably moist and juicy. To grill the sausages, I made a shallow slit, about a 1/4-inch deep, lengthwise along one side of each sausage and spread it slightly open to expose the meat. I then placed the sausages slit-side down on a hot grill pan over medium-high heat and cooked them for 5 minutes. When they were nicely browned, I turned and cooked the sausages for about an additional 5 minutes. 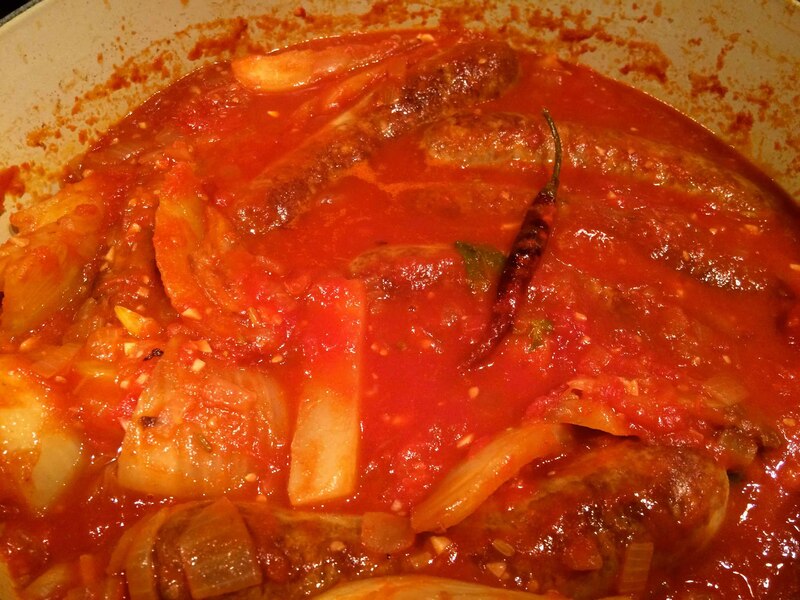 I served the sausages accompanied by this classic peperonata inspired by my Neapolitan aunt. In a large sauté pan heat the olive oil until shimmering. Add the sliced peppers and cook them, tossing occasionally, over medium-high heat for about 10 minutes, or until they start to become tender and slightly charred. Add the sliced onion and garlic, sprinkle with some salt, and cook them with the peppers, still over medium-high heat, for about another 10 minutes, again tossing occasionally, until golden brown. Add the Marsala, scraping up any browned bits on the bottom of the pan. and cook for an additional minute or so. Transfer to a serving bowl. 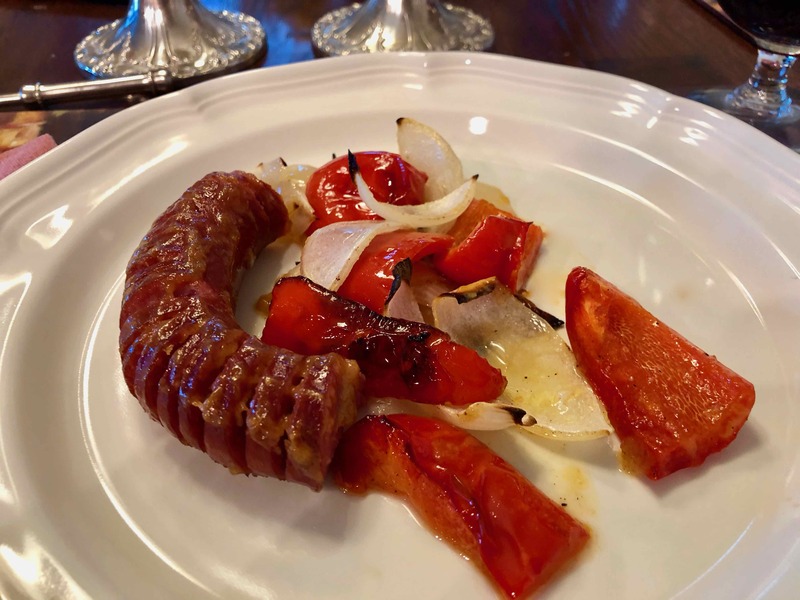 Pairing the peperonta with the grilled sausages makes a perfect weekday supper as we start to enter fall.